Today, I added some links of web sites and I am going to do much more in the future. According to the business common sense, you should not introduce links of your competitors. You link only your group members. 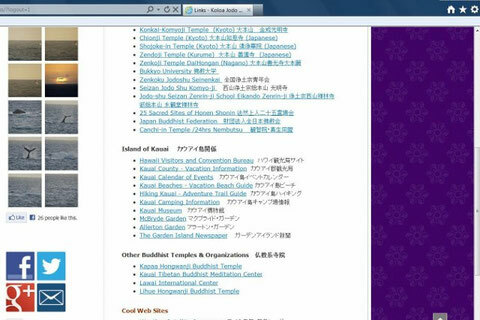 A Jodoshu temple links only Jodo shu temples...This seems to be a common sense. Fortunately or unfortunately, I don't have that common sense, but to have a sense of higher awareness that I am a Buddhist. So I can help other temples with pleasure, and I am hoping I can introduce as many Buddhist sects links as possible. When I was a little kid, many people believed that smart guy was the one who had a big head. The bigger the brain, the smarter he or she should be.....But it was not true. I knew smart guy was the one who had many networks of nerve fibers. I am hoping this web site is going to be smarter and smarter by having much more different links of internet networks.